If pink flamingos, garden gnomes and flashy garden art aren't for you, cute plant markers are a great way to add a subtle hint of style and fun to your garden. I've been working on a few different styles of garden markers lately for Fat Dog Farms and have had fun both making them and sprinkling them throughout the garden. 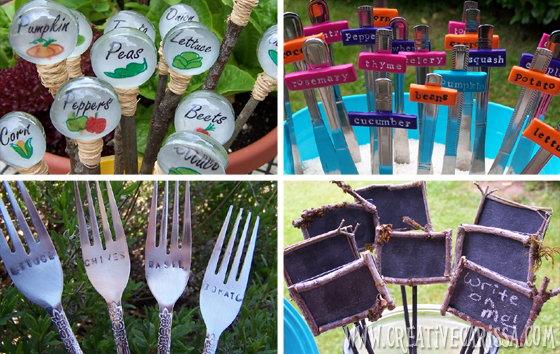 Make these from used, thrifted, or inexpensive silverware. You'll need to pick up a metal stamping set (I got mine on Amazon for about $20). I've got a mini tutorial for how to make these that lives here. These are made with large glass gems from the Dollar Tree. Printed designs are mod podged to the backs of half the gems (the backs of the other half are painted white). The gems are then glued together and to the top of the sticks. I twisted some raffia with a drop spindle to help twist it to a more rope-like texture and wrapped it where the stick and gem pairs meet. The tutorial I piggybacked on to make these is here. I saw some cute stamped clay markers over on the Reese Dixon blog that I loved and was planning on making until I saw someone combine clay and what looked like vintage knife handles on Facebook somewhere so I went this direction instead. I love these! I think they are super fun and colorful. Little wooden plaques painted with chalkboard paint and framed with twigs make fun little markers. Probably not super practical for using in the middle of the garden where it might be subject to downpour and sprinklers but sheltered porch plants or plants growing inside would be great homes for these fun little markers. I ended up selling all of these so I didn't have any left for me, but I'm planning on making more for the fall sale. 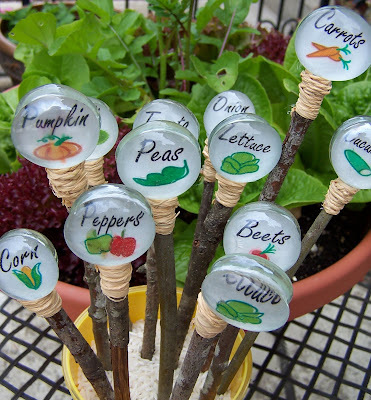 If you're looking for some more garden bling (plant markers or otherwise) I've got some fun projects from all over the internet pinned on my Garden Crafts pinterest board. I hope you enjoy! These are SUPER cute! As a teacher, I love those chalkboard markers the best! What a great find! oh wow, wonderful creations, adorable and inspiring! love all of them, i just might buy the supplies to make those! thanks for sharing! 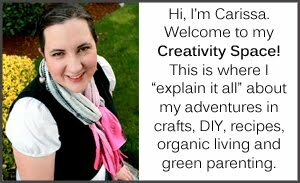 I'm your newest follower, blog hopping from homemaker on a dime Creative Blogger's Party hop! These are some fabulous ideas! The stamped silverware is my favorite. I've just recently begun to see the fork things and I am not such a fan. But those glass ones???? AMAZING!!! I love them!!! Oh my gosh! I am loving these! I even have the gems! I see some of these in my future! I am your newest follower! I would love it if you stopped by my blog and became my newest follower! Super cute idea! Thanks for letting me know about these! We just did some gardening. Great ideas! Thanks for pulling these together! I think the glass gem ones are my favorite! What a cute list. I found your blog through Skip to My Lou! I am following your blog and would love a "follow back" - Come by and see me at www.cookieandclaire.blogspot.com if you have a chance! If you have a moment today, please share this with my readers @Creative Juice Thursday Hope to see yours among all the amazing projects! I'm your newest follower! Such a great blog you have here! These are all great ideas. I especially love the glass ones. I love these ideas!! I'm your newest follower. you are really talented!!! i am your new follower!!! Love those! The forks are my favorite!! I love these! As soon as I have my herbs I'm going to make the glass jem ones :) Thanks for sharing! I love the gems and would like to try the same technique with something different. Has anyone tried these as pencil toppers? I would like to make them with monograms or seasonal images....then what?!! Can you share a link of where we can download the pictures on your gems. I like that yours have the words too. They are too cute- i am thinking of making them for mother's day. If you click the link to the tutorial I saw as my inspiration, you'll see the clip art that I modified in photoshop in order to make my markers. You could also find clip art from a similar family from Microsoft Design Gallery Live (just google "Microsoft DGL"
I love all of them. Especially the stamped forks! LOVE!